Sometimes I am asked to do something out of the ordinary, something that pushes the limits a bit. Something that takes the same amount of concentration and steady hand to produce, but with very different results! 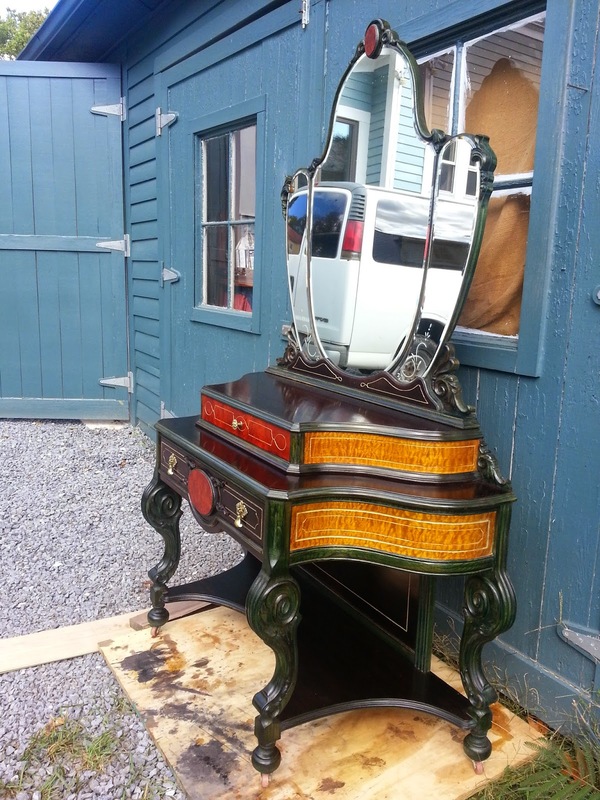 This vanity was such a piece, and it was a lot of fun to refinish. 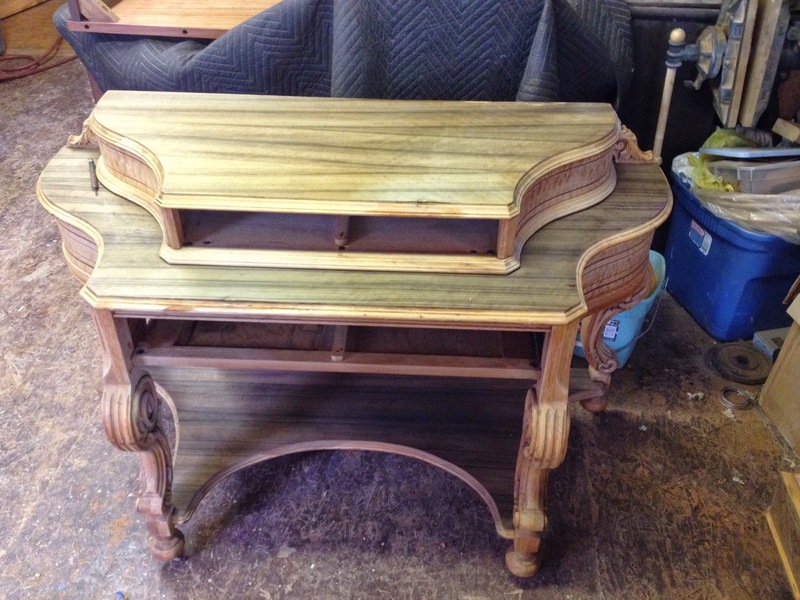 The piece itself was from a larger bedroom set and was made sometime in the 20th century, I am guessing the 1940's but it could easily be earlier or later. 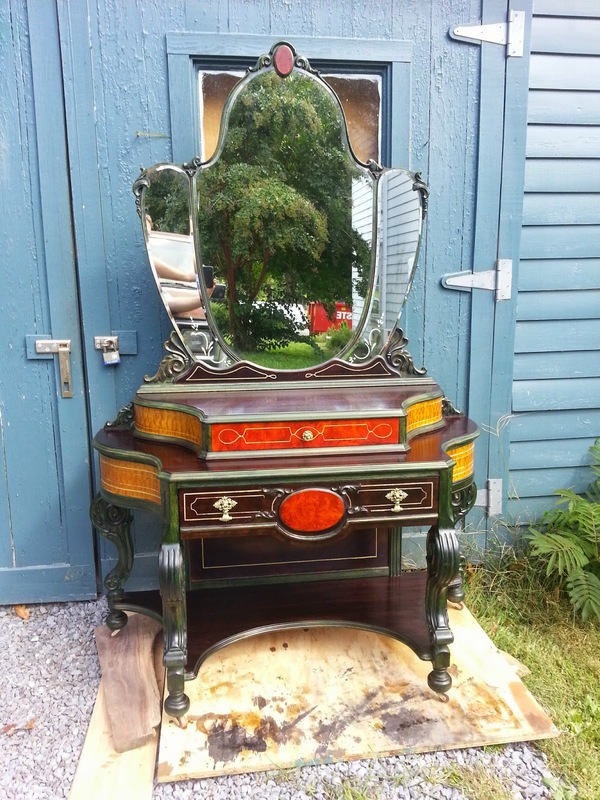 The vanity was a factory made piece and had exquisite veneers. It seemed that almost every surface was covered with a different veneer, which made the piece lend itself to what the owner had in mind, which was to transform it into something out of a fairy tale or fantasy. This was achieved by using a variety of stains, mostly of solid colors like orange, yellow, blue and green. A bold change from the wood tones I usually work with like light walnut and light red mahogany. The result was a fantastic piece that accomplished its goal in every way. 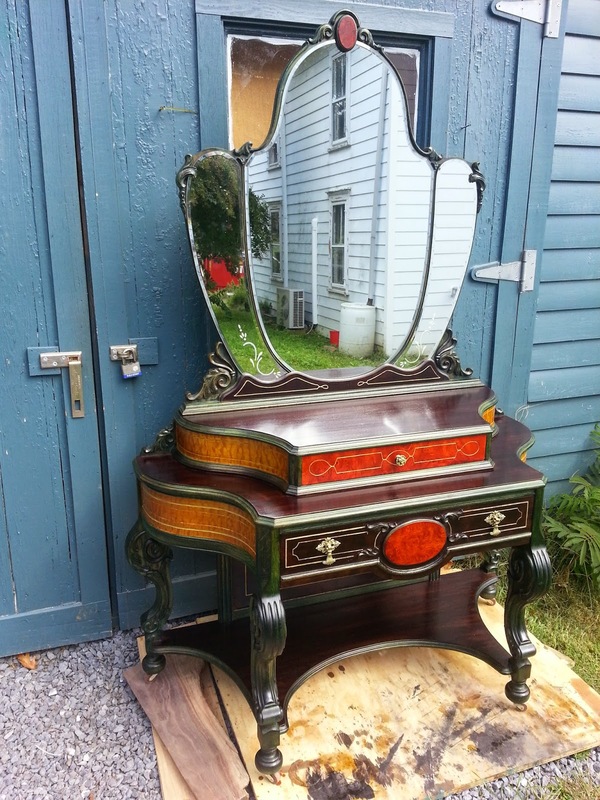 My feelings were confirmed the other day when a friend came into my shop, saw this vanity, and said " Wow, that is straight out of Alice in Wonderland!" 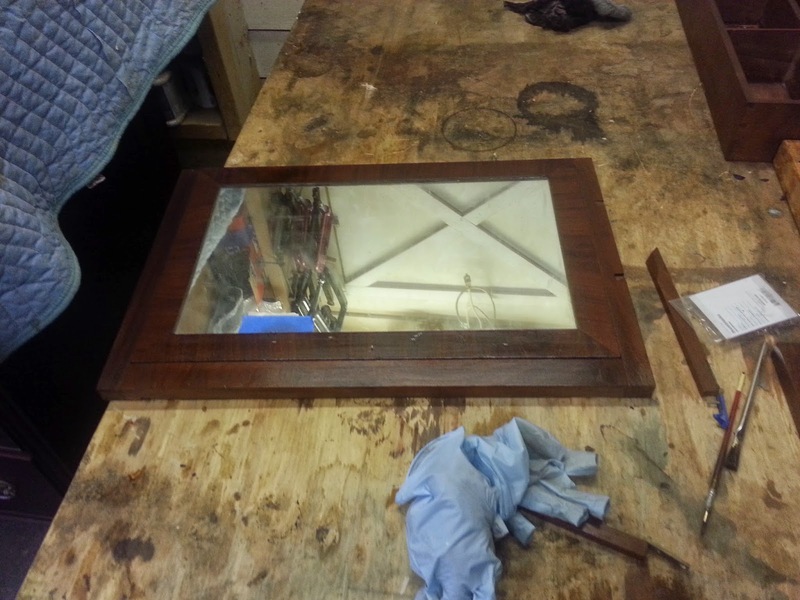 Below are a few shots of the repairs meant mostly to show the piece before it was transformed. These next few photos are of the finished piece. the light carving incised into the drawers had a gold leaf paint brushed into them which really set the piece off. This was a fun project and the customer was happy with the results, which made me happy! 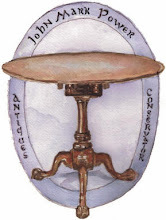 This blog post concerns a piece I recently restored for an estate in Jefferson County, West Virginia called Cedar Lawn. If you are interested in viewing other pieces restored for this house, you can click on the label to the left that says "Cedar Lawn". The piece in question is a bit of an oddity. 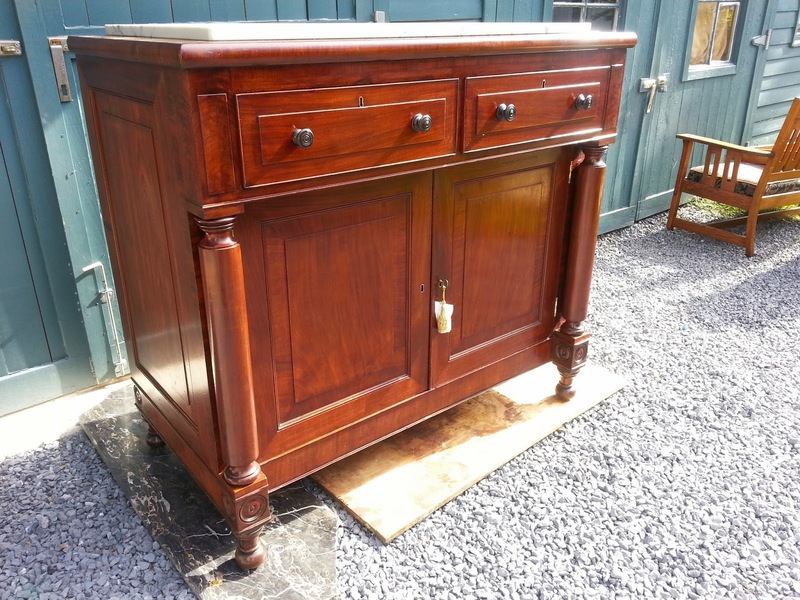 It has all of the lines and construction details of a sideboard, but when the bottom doors are opened, they reveal an inner cabinet built in to the larger cabinet that houses a series of drawers. In addition, the two drawers above the drawers open to reveal a mirror (originally two, one in each drawer) that folds out and is adjustable. Behind the mirror are three little drawers built into the larger drawer. In front of the mirror are trays and one removable tray (again, there were originally two trays, one for each drawer). 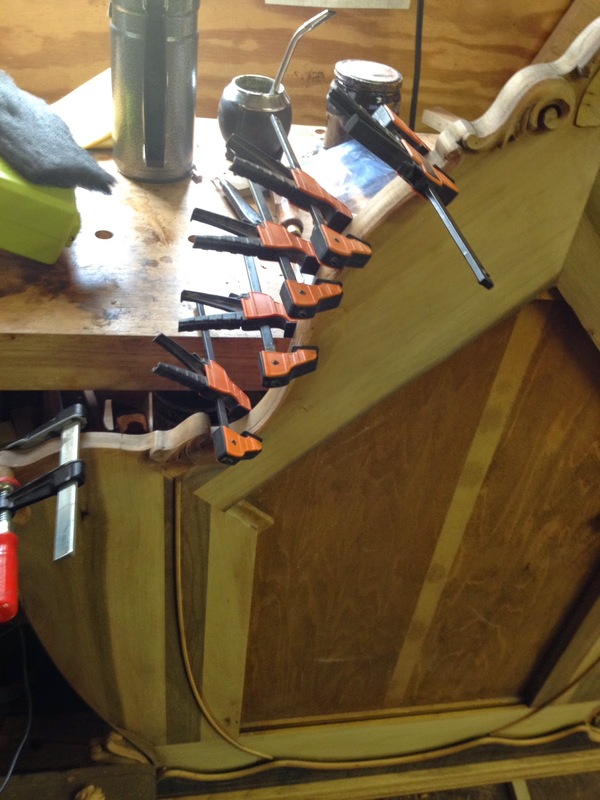 It is as if someone walked into a cabinet shop and said, " I like that sideboard over there you are working on. 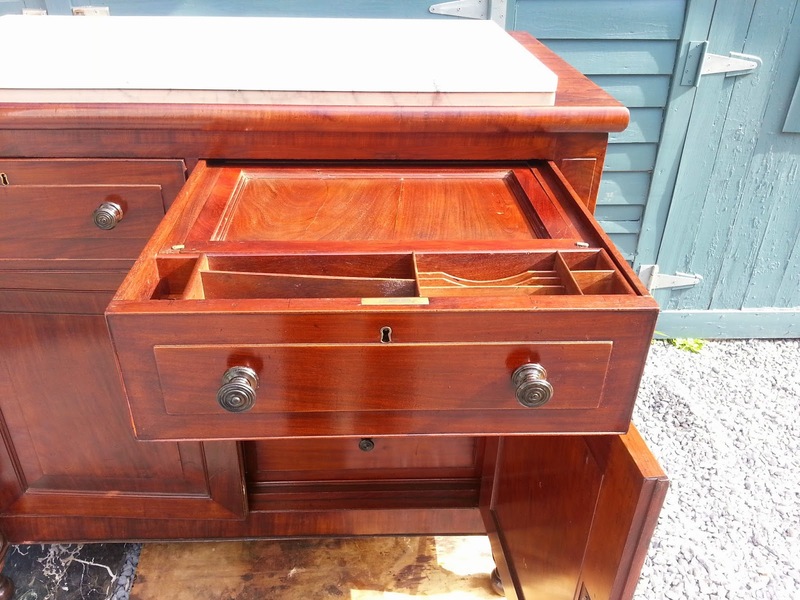 Is there any way we can make it into a dresser/ dressing table?" In fact, something like this is what likely happened. If you look at the price books distributed in the early 19th century ( for an example click here: https://archive.org/details/cabinetmakerslo00unkngoog ) you will see that a piece of furniture was sold in its basic form. From there you could pick and choose features that suited your needs and the price would be raised accordingly. This cabinet was probably started with one idea in mind, and then customized to fit the needs of the particular customer who bought it. 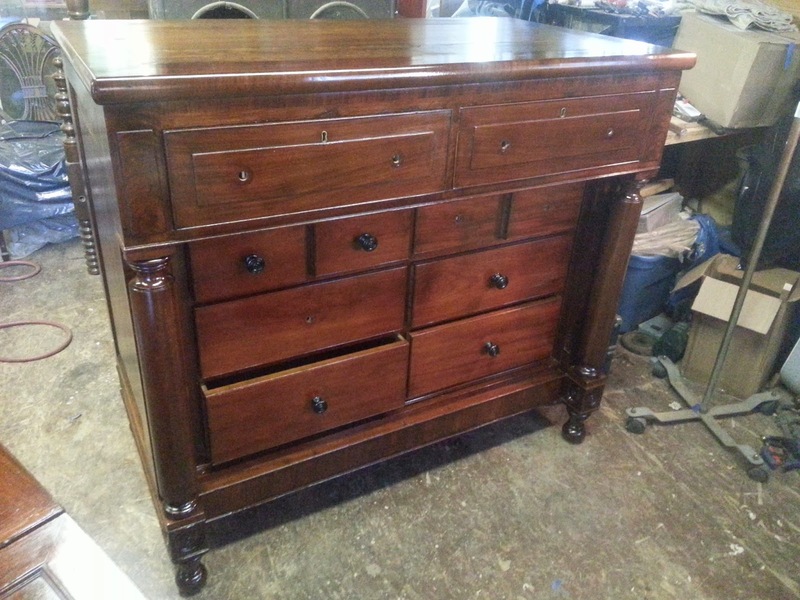 The inclusion of the separate inner cabinet that housed the drawers, held in place with screws, and finished with some molding around the edges, would suggest this. 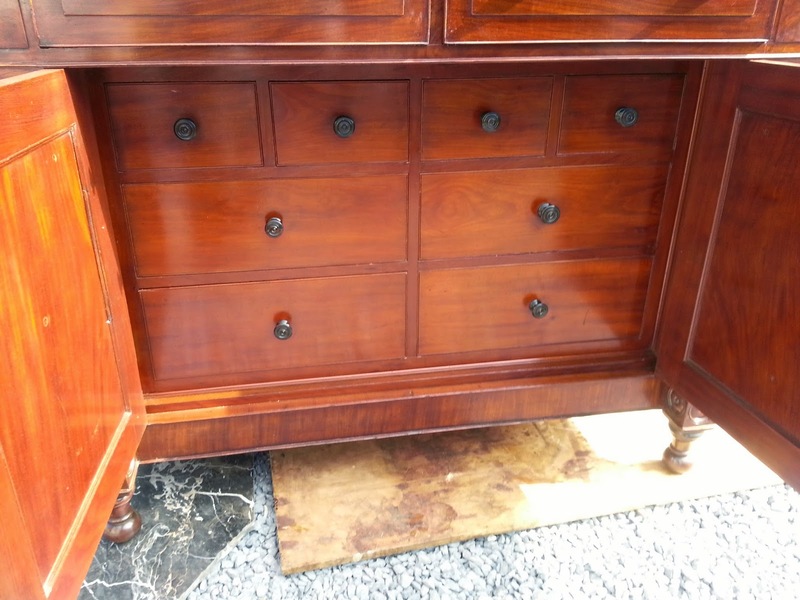 It would be easy to remove or install this inner cabinet, where, if the piece were intended originally to be used as a dresser, the drawer framework would be integral to the cabinet. At least, this is one theory, and there is probably some validity to it. That being said, the early 19th century was a time of innovation and playing with forms. 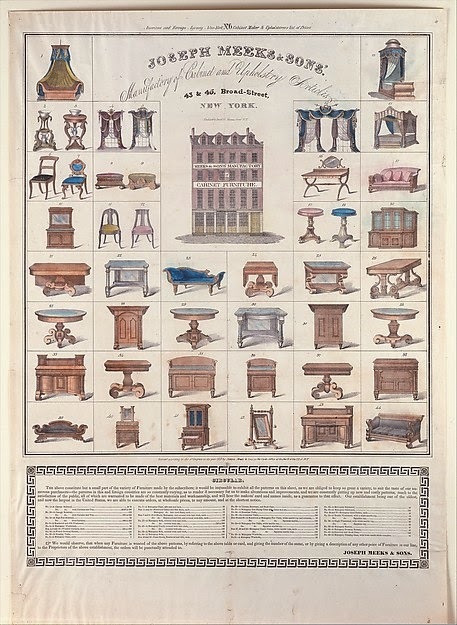 Below is a broadside showing the wares of Joseph Meeks & Sons, a prominent cabinet making firm from New York and competitors of Duncan Phyfe's cabinet making firm (not to mention the firm that built the bureau in question). At first glance one can see the variety of pieces offered by Meeks & Sons, in the latest styles and fashions. What caught my eye is the piece second row from the bottom and to the far right. 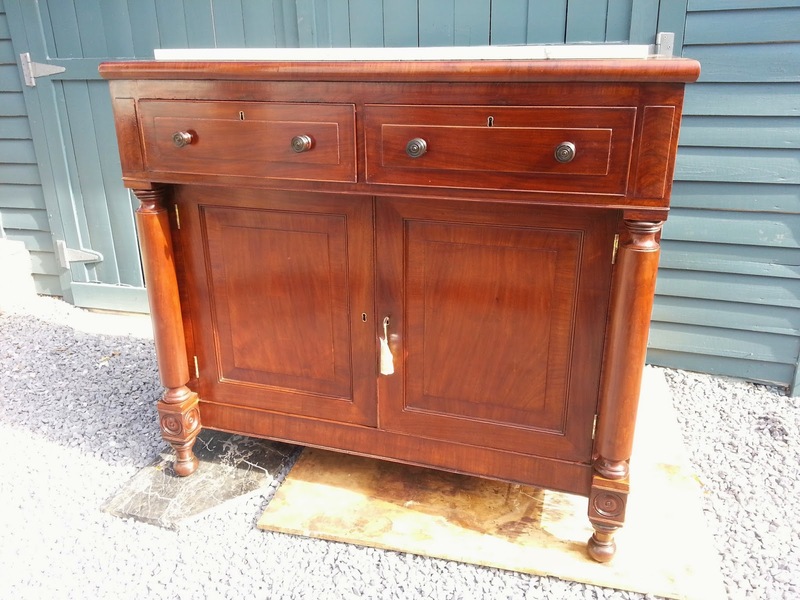 It is not visible in the image above, but the listing describes this item as a bureau. Bureau is one of those lovely terms in furniture that has a loose meaning. It can either refer to a desk or a dresser. 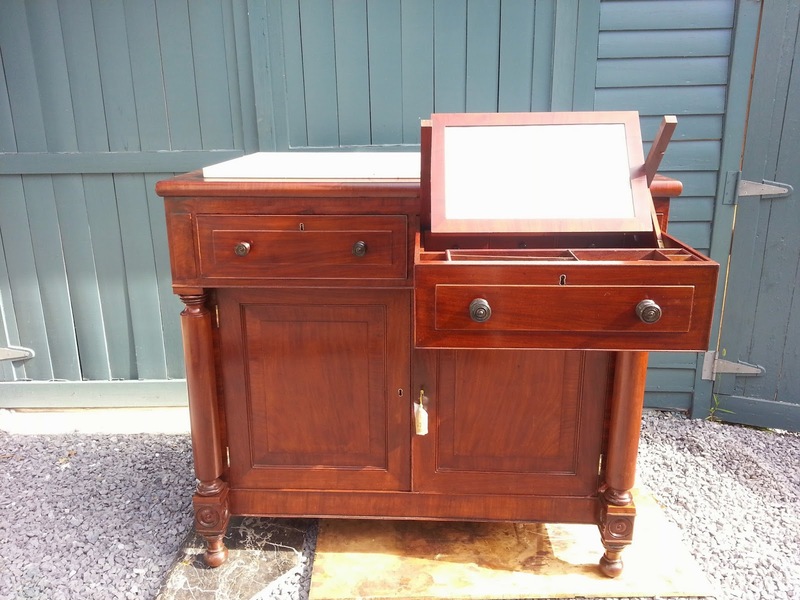 If this were a desk, it was probably of the same kind as what we refer to as a butler's desk. If it were a dresser that "Bureau" was referring to in this ad, the layout would have been similar to the piece I worked on. Because of this ambiguity, I thought that bureau would be a perfect way of describing this piece, which seems to be a mix of two forms. What I do know about the piece through inspection, was that it was made in a city center on the east coast some time in the first two decades of the 19th century. The piece could be Baltimore, but I am inclined to think it came from Philadelphia or New York. The inclusion of a white marble top might suggest one of these places because marble was used throughout the east coast on fine pieces, constructed near ports, during this time. 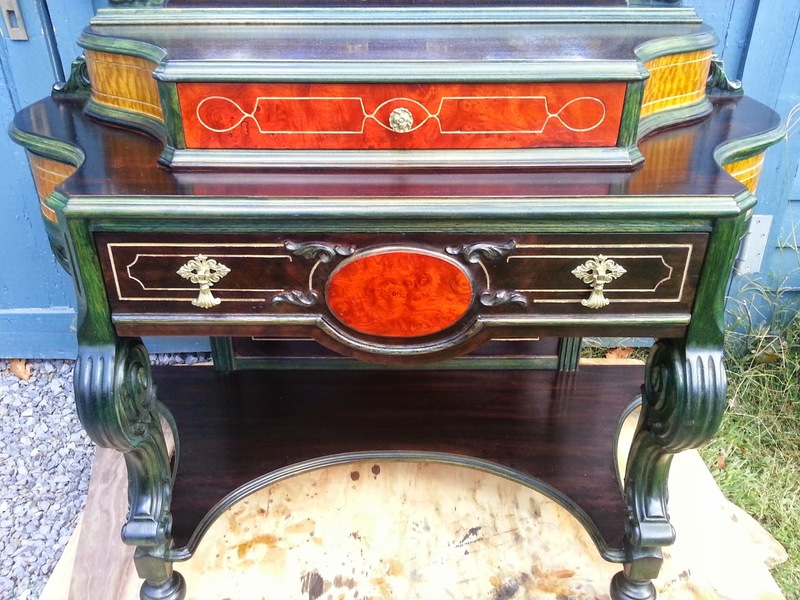 The primary wood used in the piece is exquisite mahogany, both in veneer and solid form. 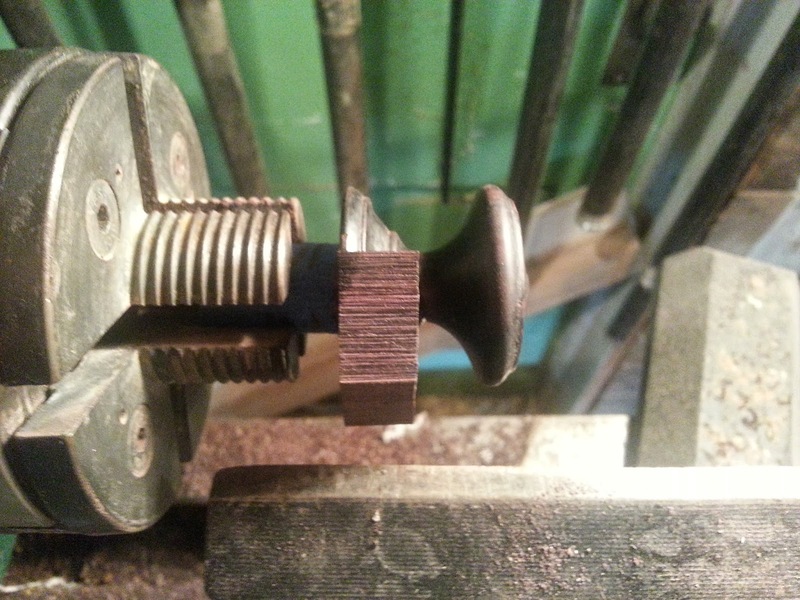 The knobs are made of rosewood. 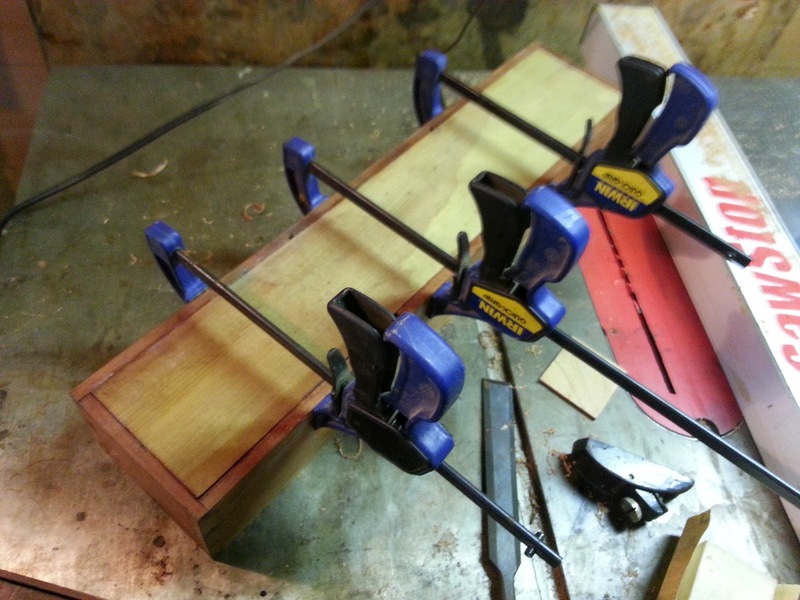 The secondary woods used in the piece are poplar and pine. All of the timbers used were selected for their beauty as well as their stability, and as a result, two hundred years later there was minimal cracking and loose veneer/ joinery. This was a well made piece made by professional craftsman who did exquisite work. 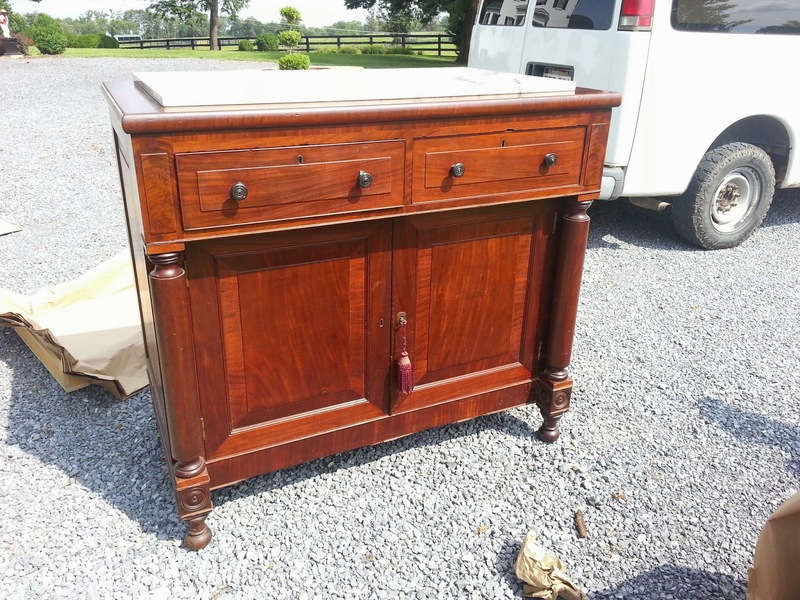 It is my belief that this piece was made by a cabinet making firm such as Meeks or Phyfe, somewhere on the east coast, and not by a sole cabinetmaker. Even with such superior workmanship at hand, time took it's toll on this piece, and the damage was plentiful when I first saw it. 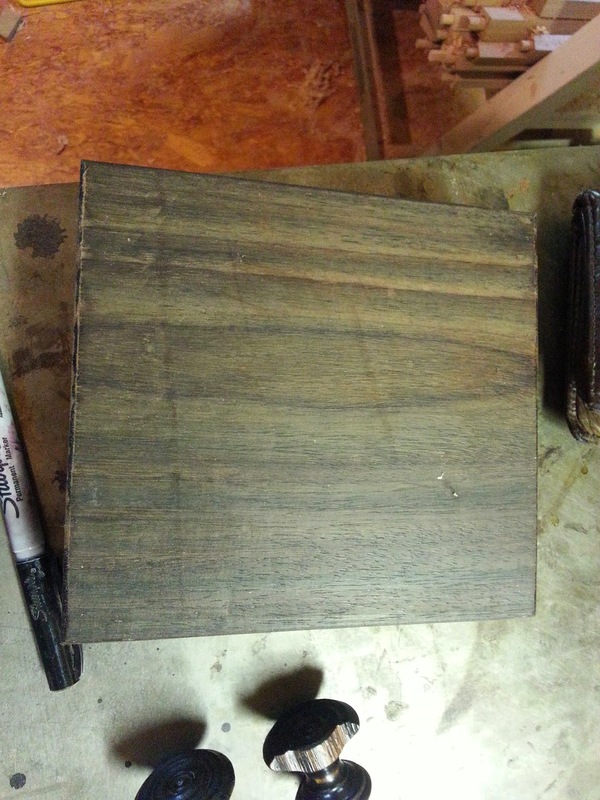 Below is a photo of the piece as it came to me. 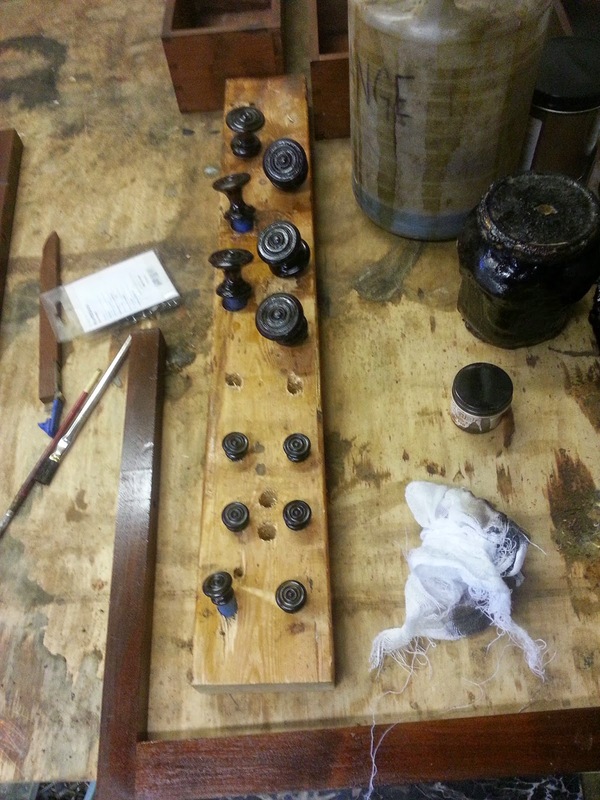 One of the big problems was that the rosewood knobs had broken off in places and one was missing entirely. 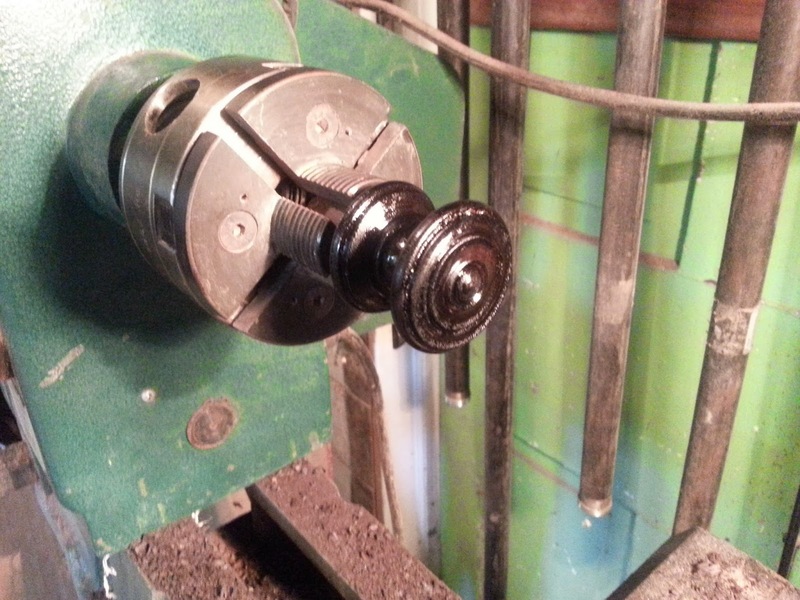 Below is a photo of one such knob. 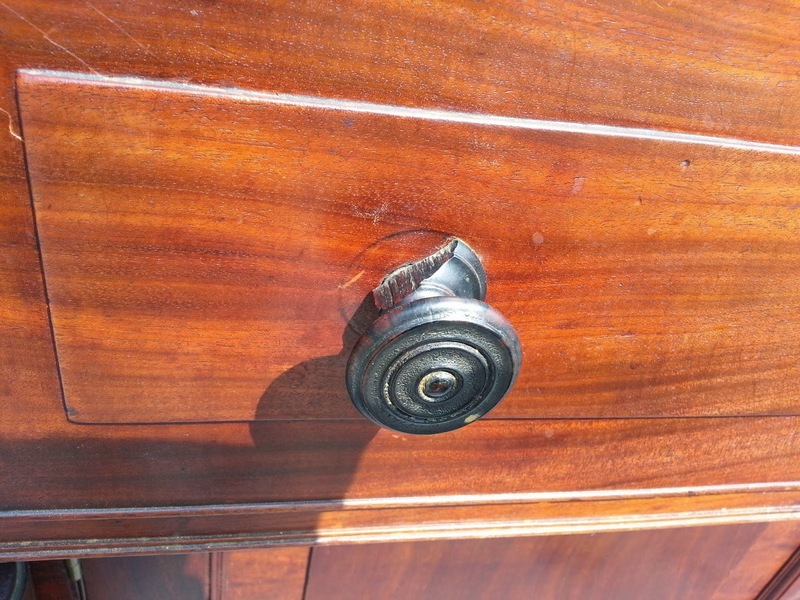 An interesting detail of construction was how the knobs were attached to the drawer fronts. 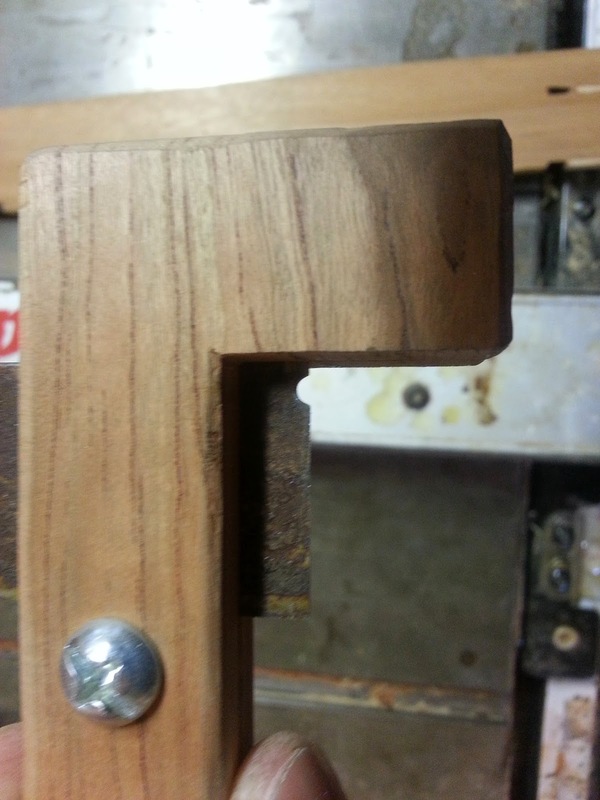 The knob had an integral tenon that fit into a corresponding hole in the drawer front. 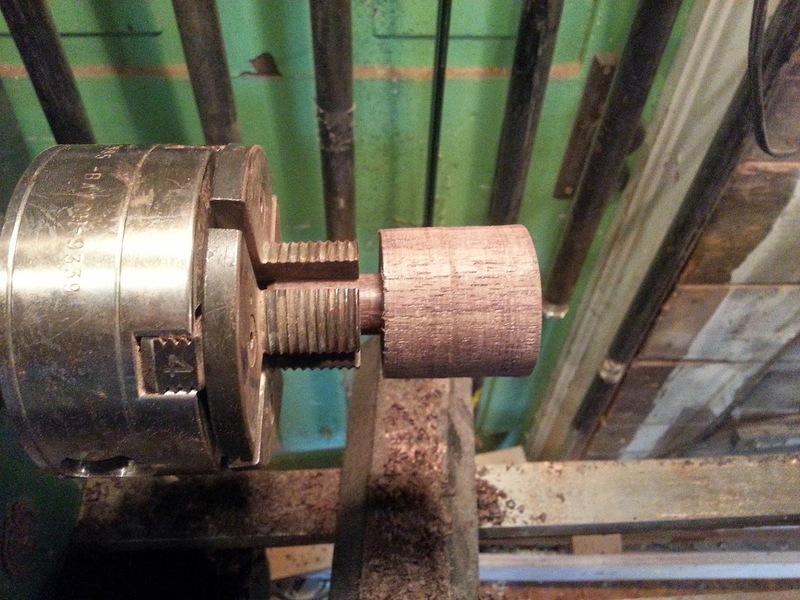 Then a hole was drilled through the top edge of the drawer front straight down to and through the knob's tenon at a perpendicular angle to the knob. 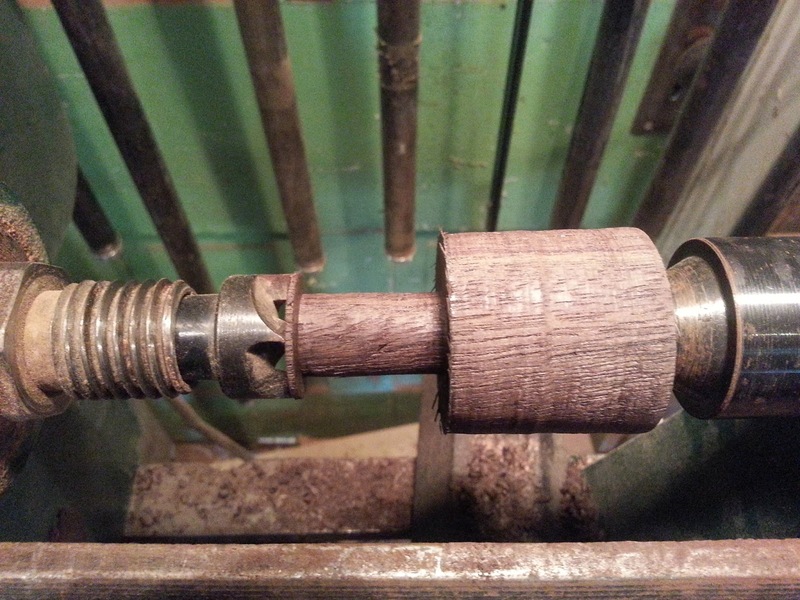 A long oak or ash dowel was then inserted in this hole locking the knobs in place. 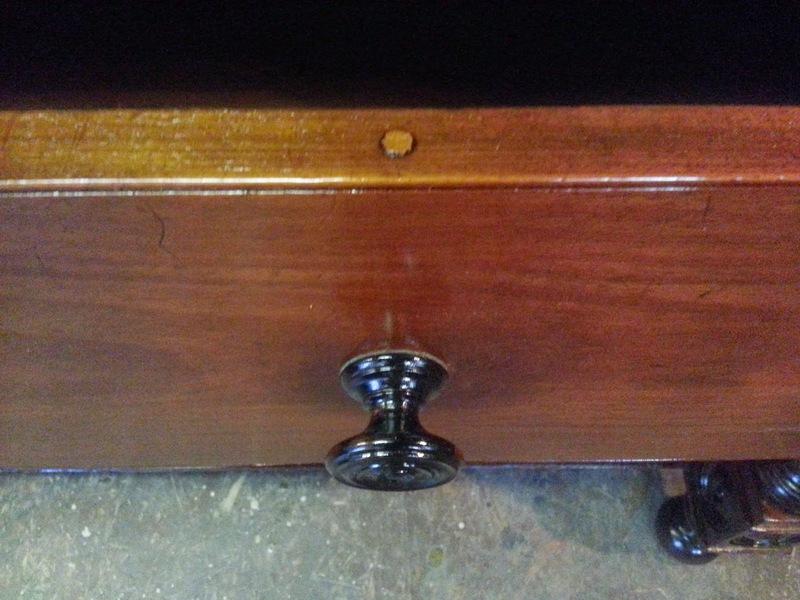 This detail is seen below where the top of the dowel is visible on the top edge of the drawer front. 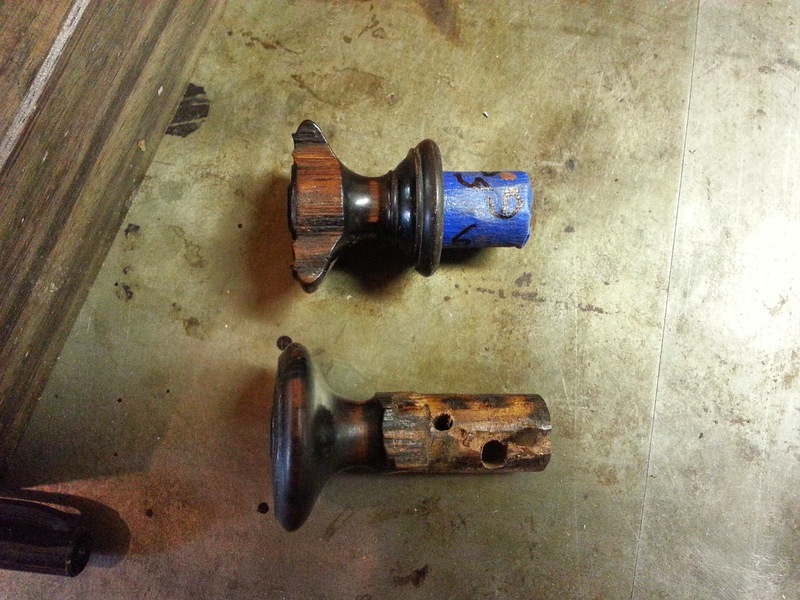 This made removing the knobs challenging, but in the end we were able to remove them so they could be repaired, as seen in the photos below. 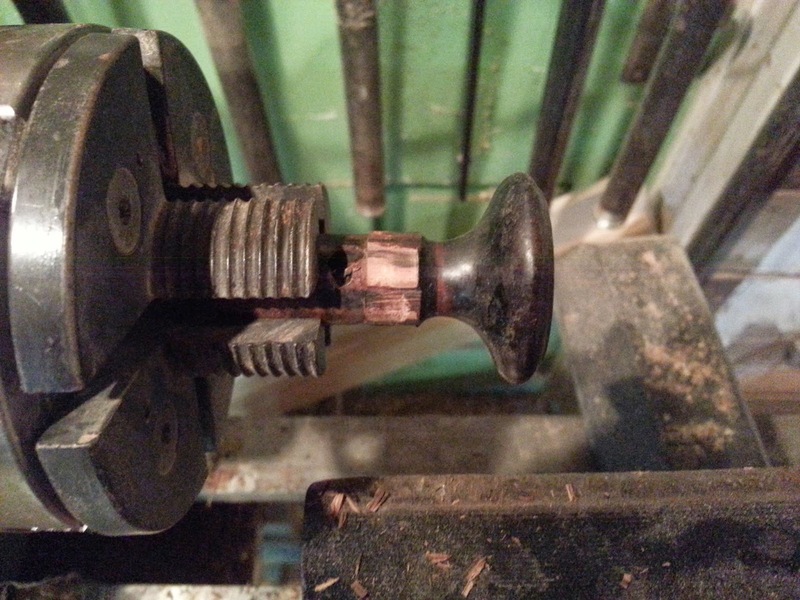 A nice block of rosewood was procured to repair the broken knobs and turn the new knob, as seen below. Before getting into the repair of the knobs, I thought it might be interesting to detail how the knobs were made in the first place. Since I needed to make one, I took photos along the way. 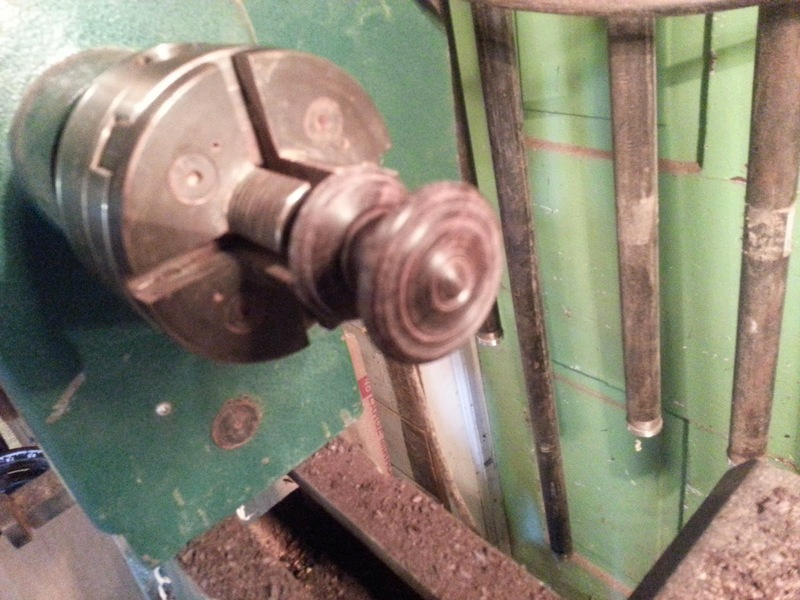 The knobs were started between centers on the lathe with the grain running parallel to the bed of the lathe (as opposed to face grain knobs). 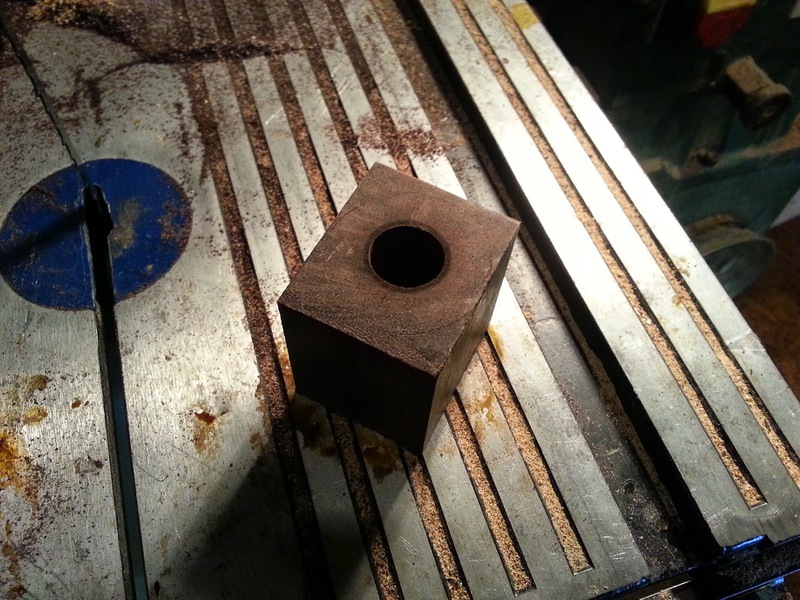 I started with a square blank that fit the dimensions and turned it to a cylinder. 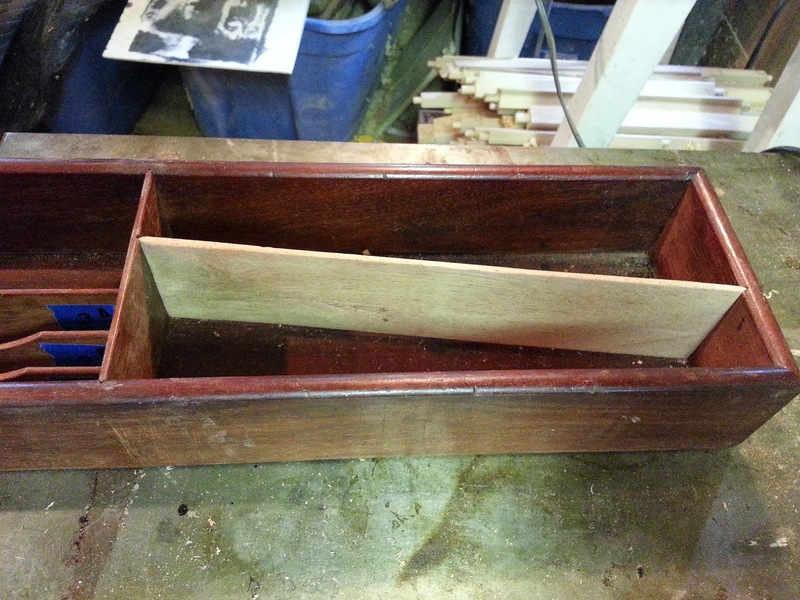 I next tuned the tenon on one end that would ultimately be inserted into the drawer front, as seen below. 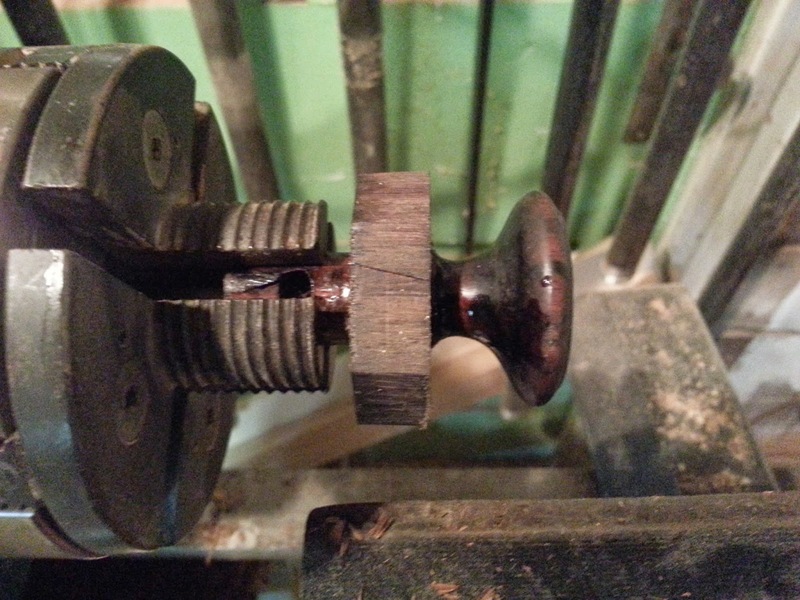 The next step was to remove the blank from the between the centers and mount it in a chuck, so that the tenon was held while the other side could be worked. 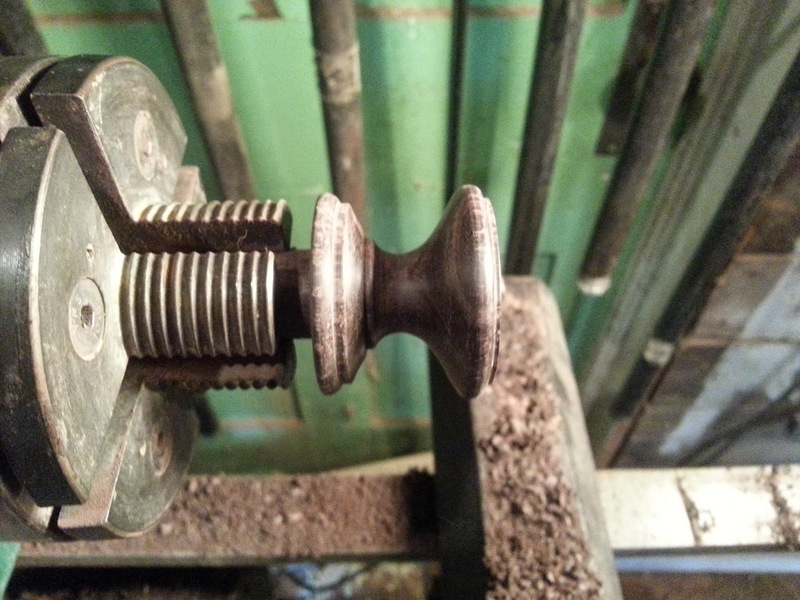 From there the details of the knob were turned. 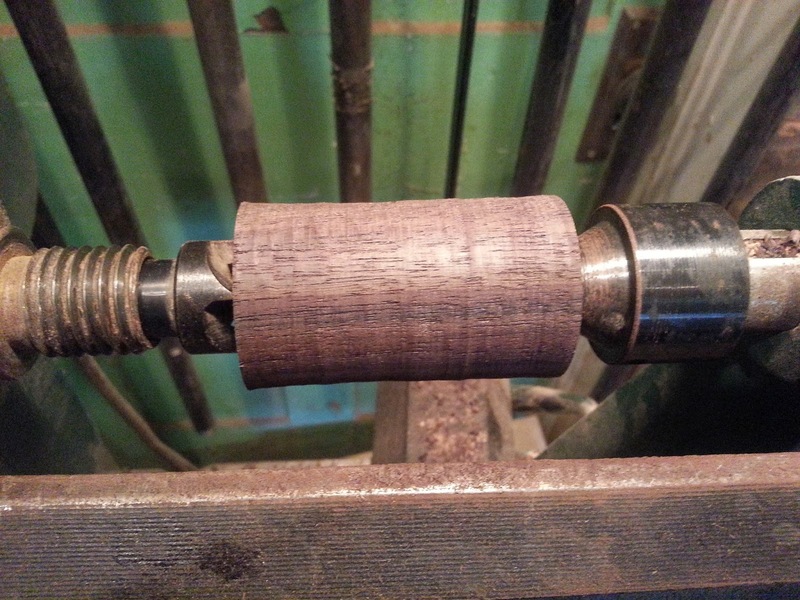 The finished product was stained and finished while still on the lathe. After that, I turned to the repair of the original knobs. 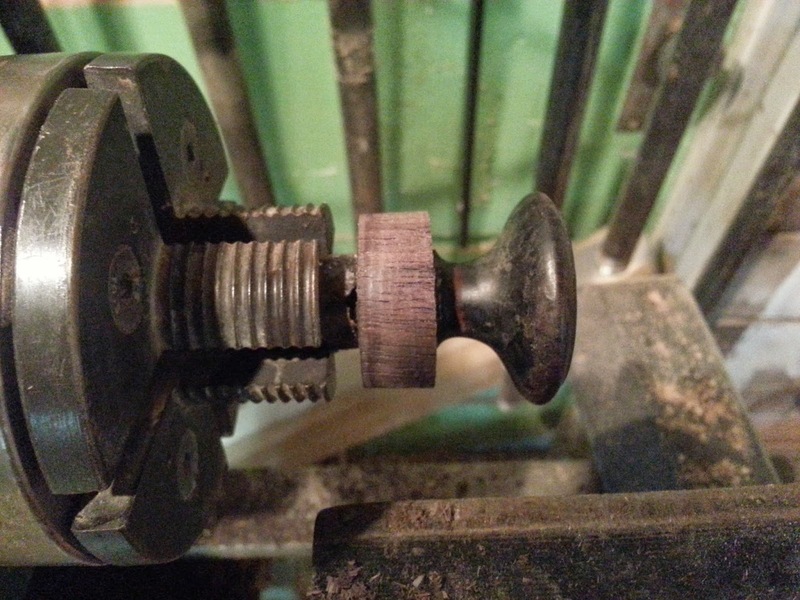 The first was missing the back side of the knob, where it meets the face of the drawer. 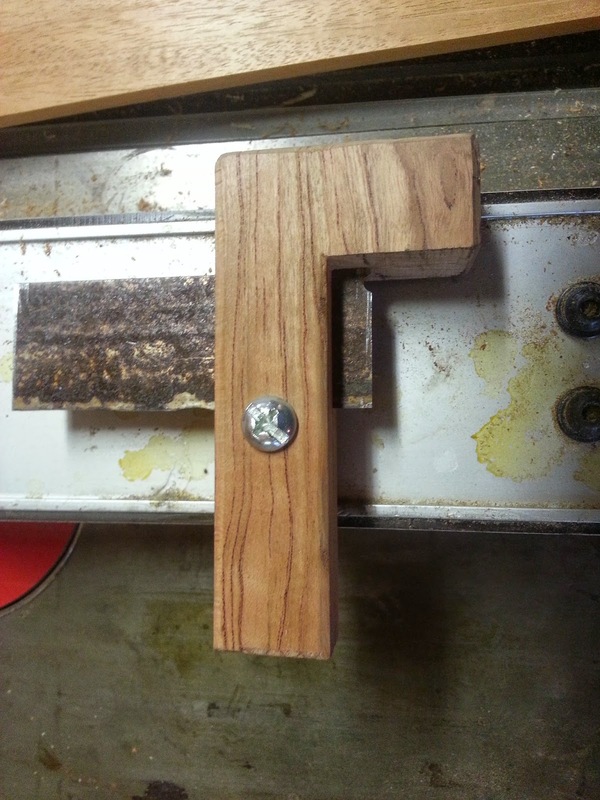 The blank I made to patch this had a hole drilled in it so I could slip it over the tenon and glue it to the knob. 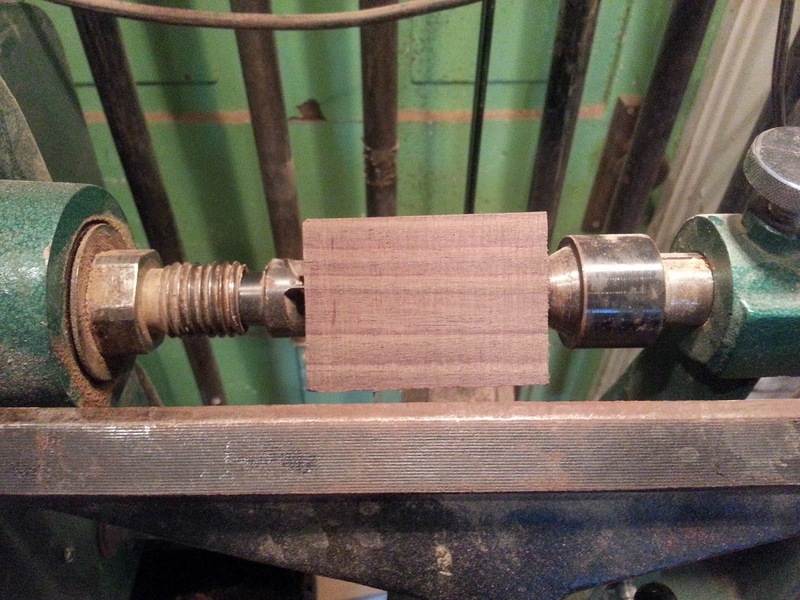 This bank was then cut into an octagonal shape to reduce turning time, and the proper amount was cut on the band saw. 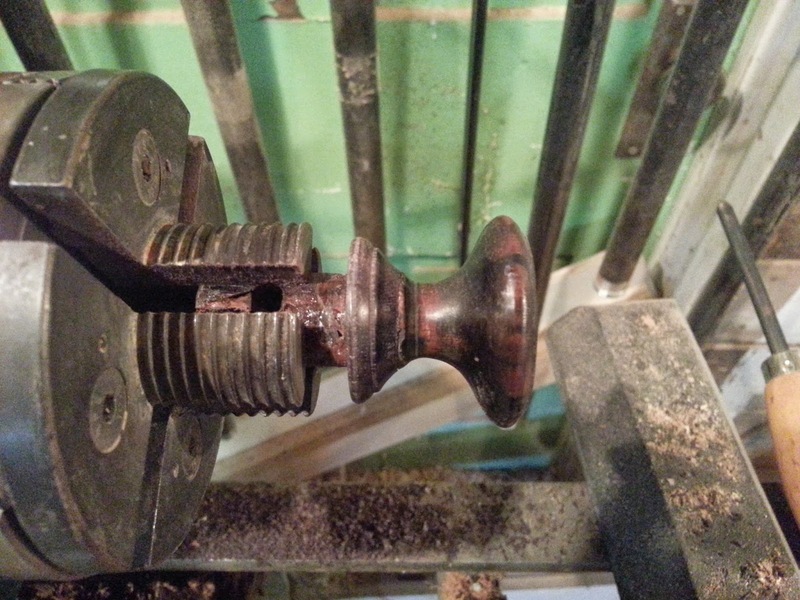 The knob itself was turned to match the diameter of the blank and the blank was glued to the knob as seen in the next two photos. 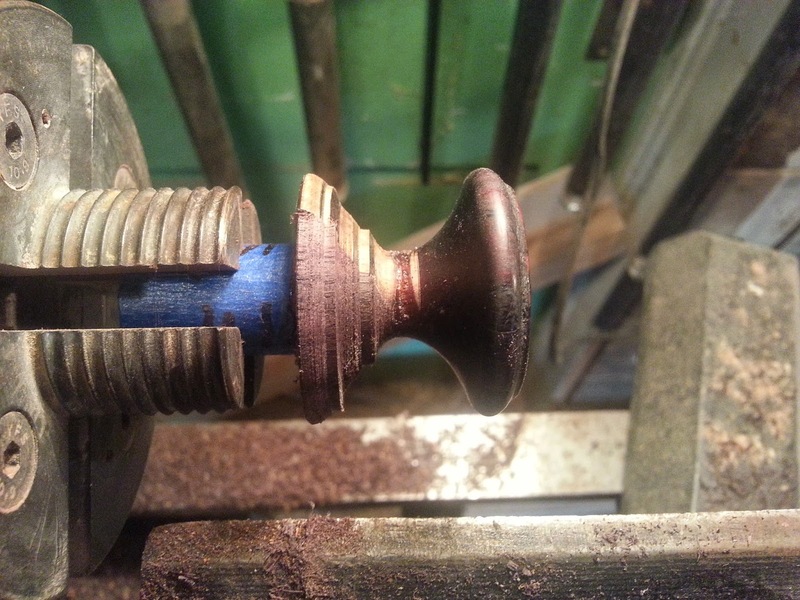 Once the glue had dried, I mounted the knob on the lathe and turned the blank to the appropriate profile, as seen in the next four photos. 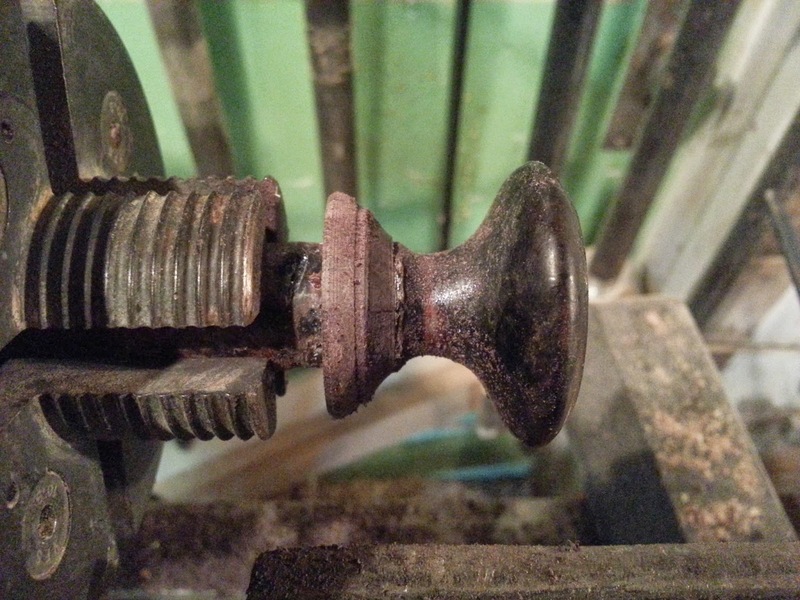 This next knob had a similar issue, and it also needed part of the front of the knob turned. The repairs are seen in the next two photos. This one was my favorite! 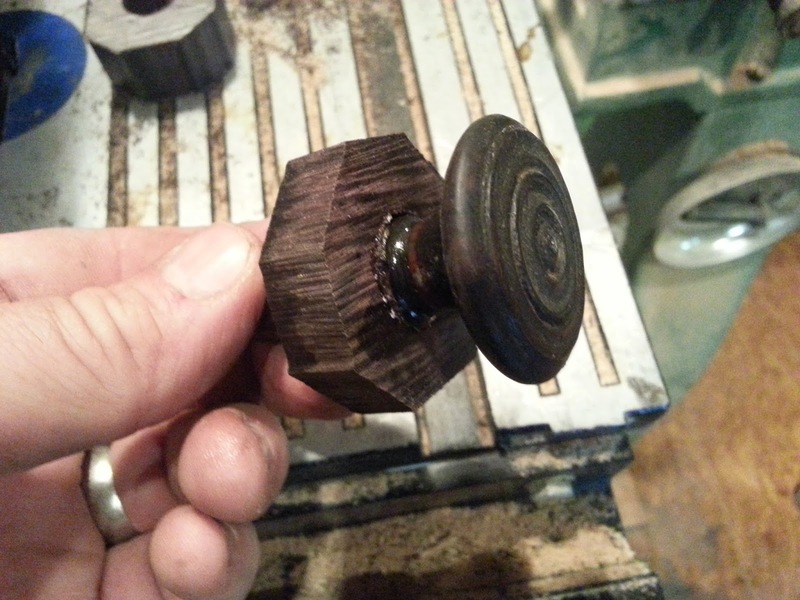 Much of the knob was broken on the back side and a large blank was glued to the knob. 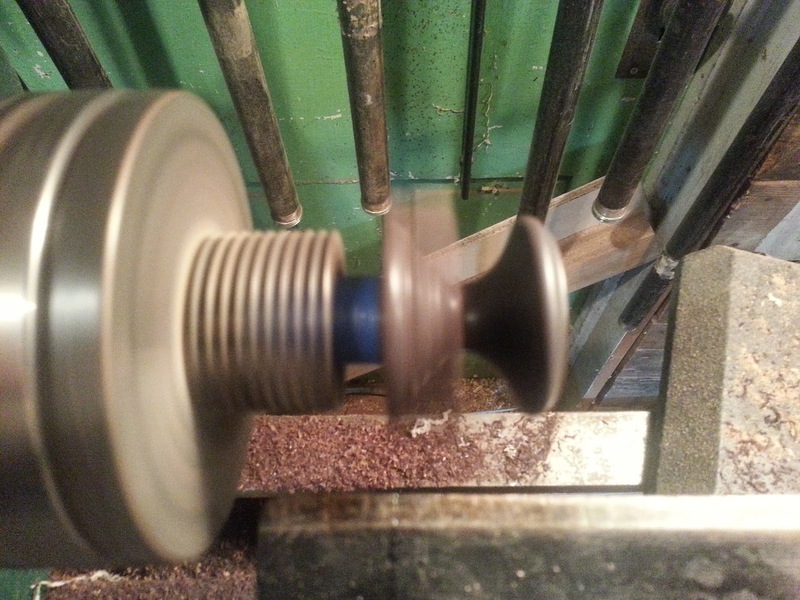 When the lathe was turned on, the silhouette of the original knob could be seen "through" the spinning blank, as seen in the next photo. By watching my tool and looking at the original profile, I was able to turn down to that original profile. 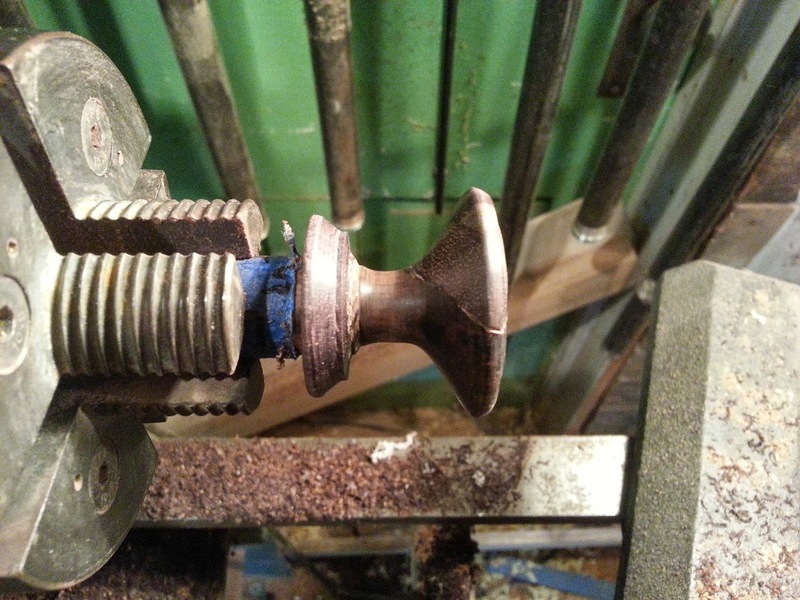 This method was used throughout this process with the knobs and gave very accurate results. Moving on to the case, there was a great deal of molding that was missing from the case. Most of this was what is called Astragal molding and consists of two flats with a hump in between them when viewed in cross section. 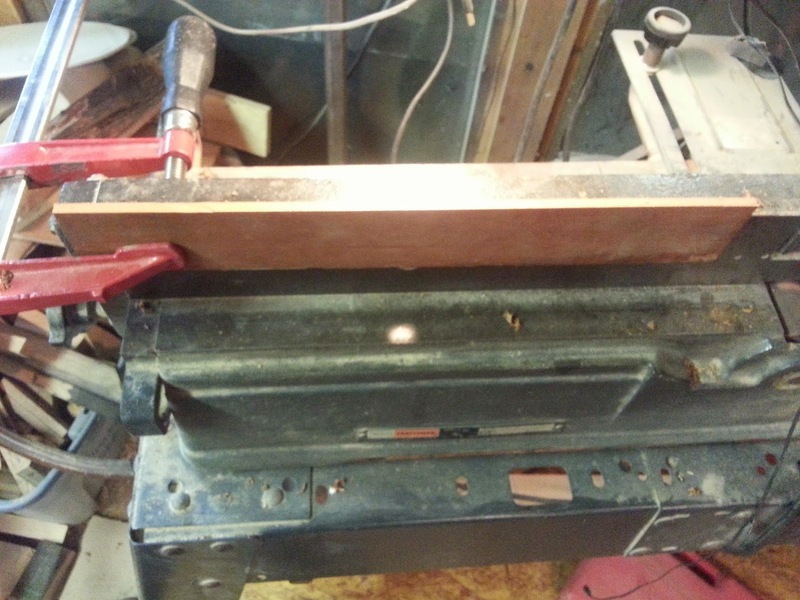 To make replacement molding, I made what is called a scratch stock, which is a piece of metal (a section of a saw blade from a wood-mizer) with the profile of the molding cut into the metal. 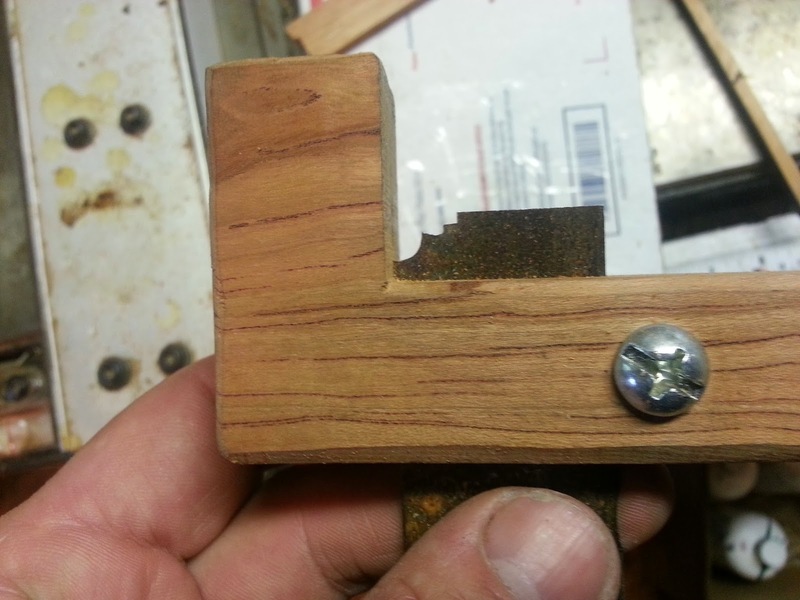 the metal is housed in an "L" shape holder and a bolt is run through the wood to compress the wood around the metal and hold it in place. 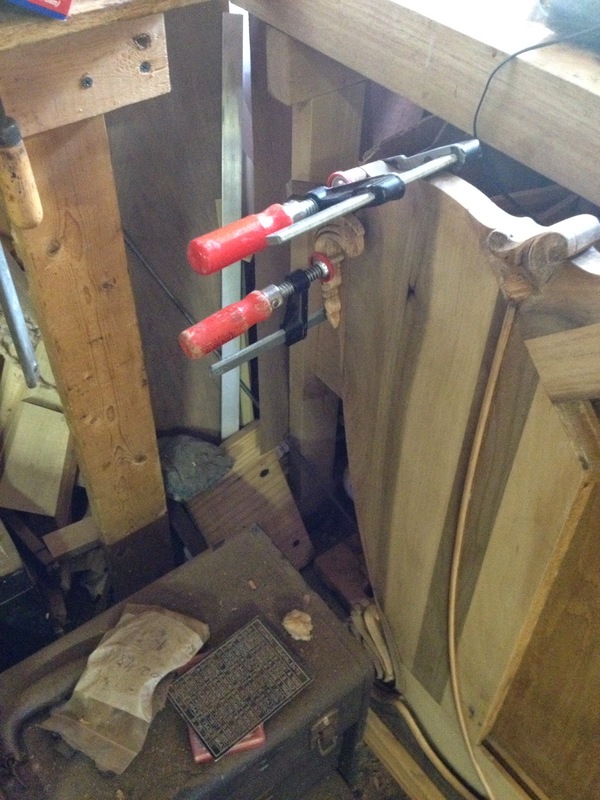 The shop made tool is seen below. In the bow of the "L" shape is the protruding metal and cut into it is the hump part of the molding. 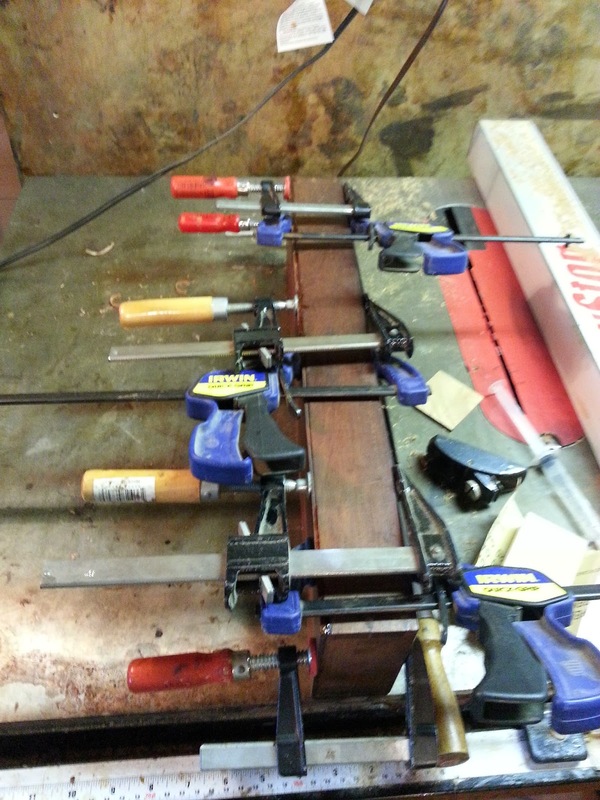 Once I got a blank to the proper thickness I clamped it to my joiner, as seen below. 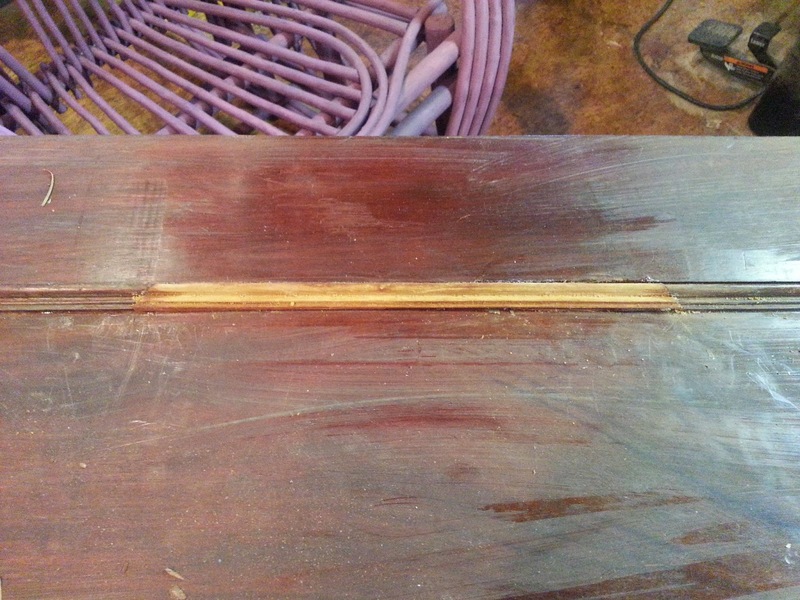 By dragging the scratch stock over the wood at a perpendicular angle, I was able to produce the molding, as seen below. 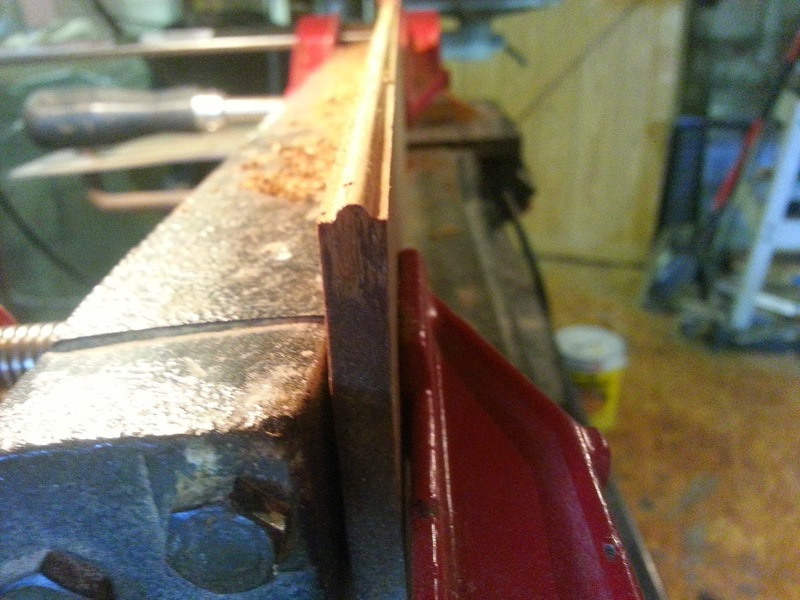 Once I was satisfied with the molding I would rip it from the stock on the table saw and with a bit of refinement I had replacement molding. The second profile was seen around the inside panels of the doors. This was a bit more complicated and the profile can be seen below cut into the metal. 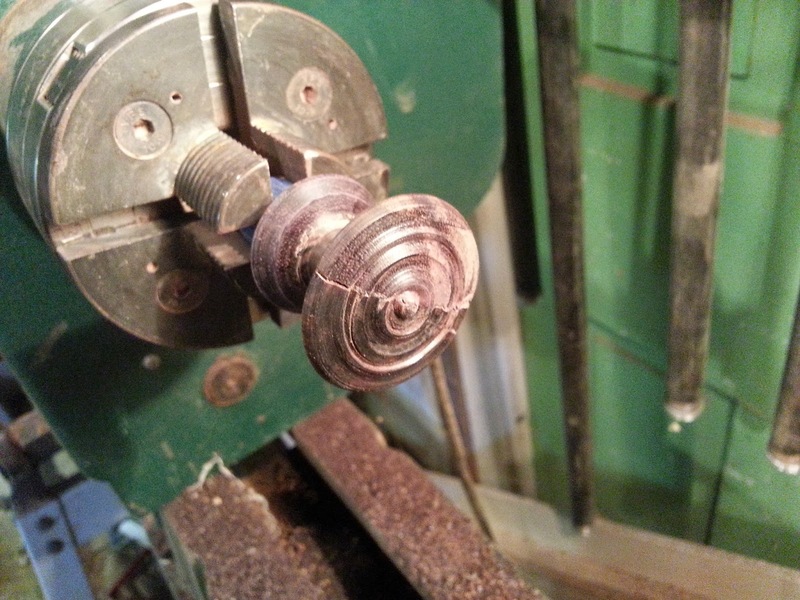 the same process was used to make the molding, as seen below. The finished patch of molding, in the door and ready for finish and touch up. this next piece shows the piece during the cleaning process. The yellowish haze on the drawer fronts is dried wax that had been separated by mineral spirits. 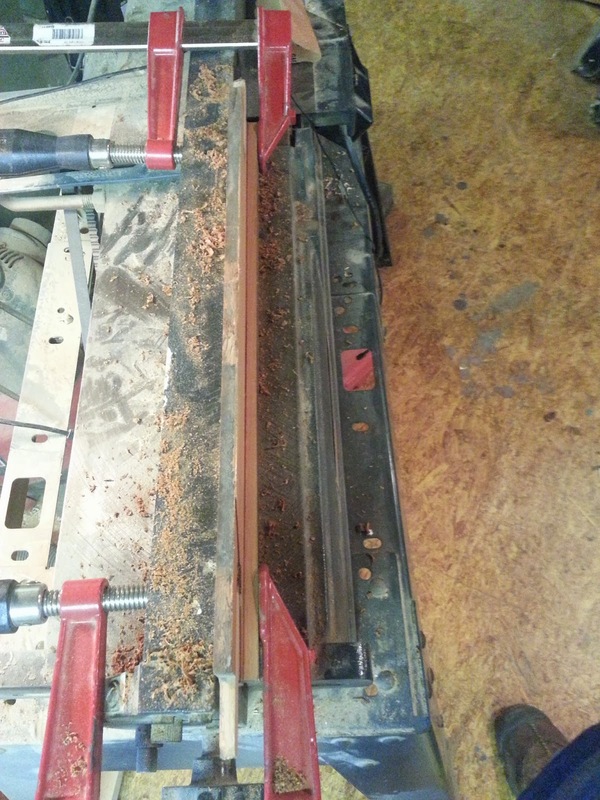 Some of the inner trays needed some repairs, as seen in the photos below. One interesting repair was performed by Jesse, who works with me. The columns had deep dents in them from things banging against them through the years. One of the columns is seen below with the dents visible. 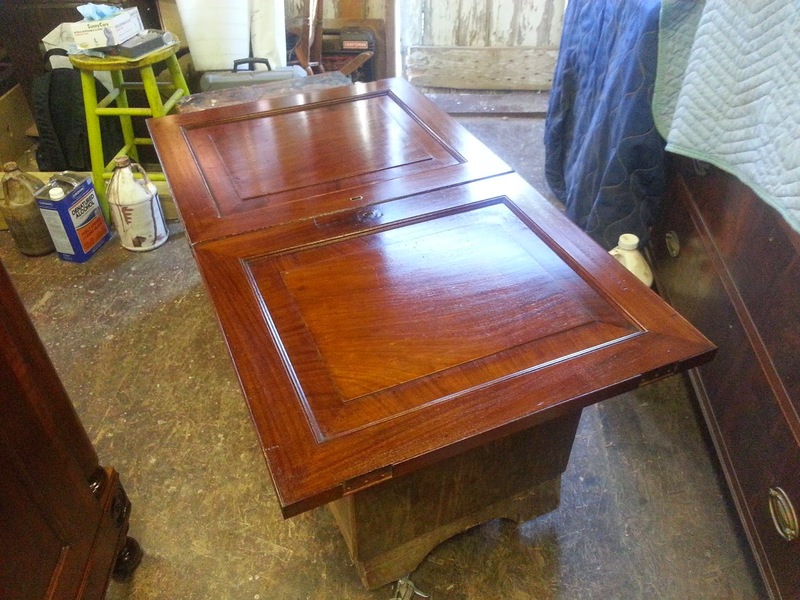 By applying steam to the dents the wood moved back out to where it had originally been. The steam was applied by using an iron and a wet rag. The watery rag was placed over the damaged area and the iron applied to that. after awhile the dents were nearly gone, as seen in the next photo. The two upper drawers both had damage where the thrown locks had smashed into the case front breaking off bits of wood in that area. Below are some of Jesse's patches on the damaged case. 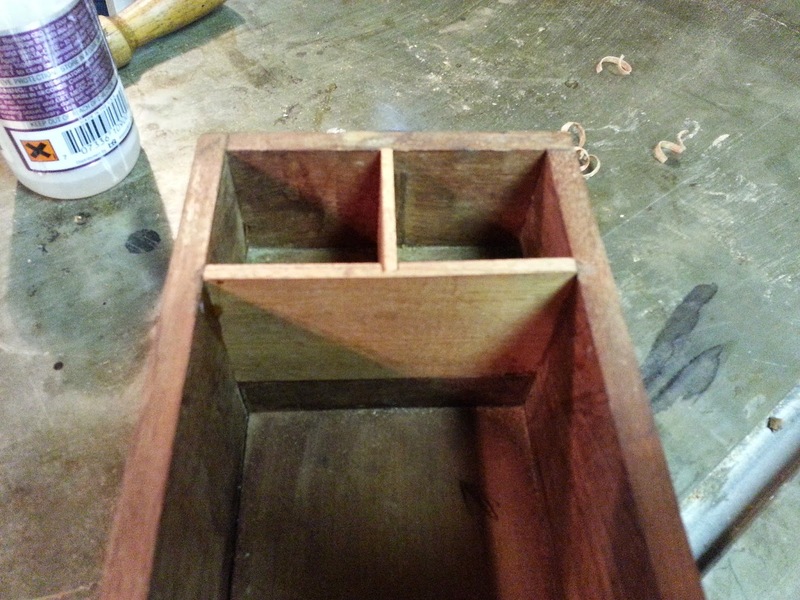 One of the interior draws needed a patch on the corner, and Jesse provided the work on this as well. The results are seen below. 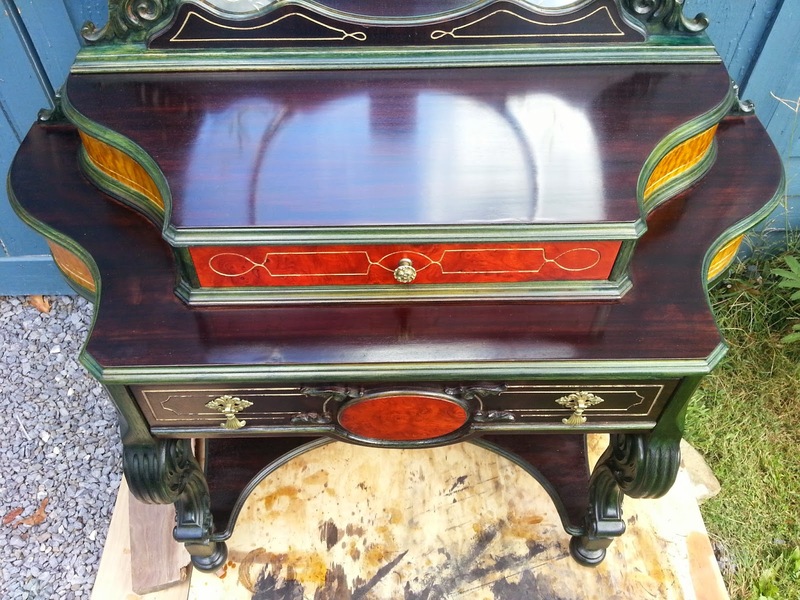 these next few photos show various parts of the dresser during the finishing process. 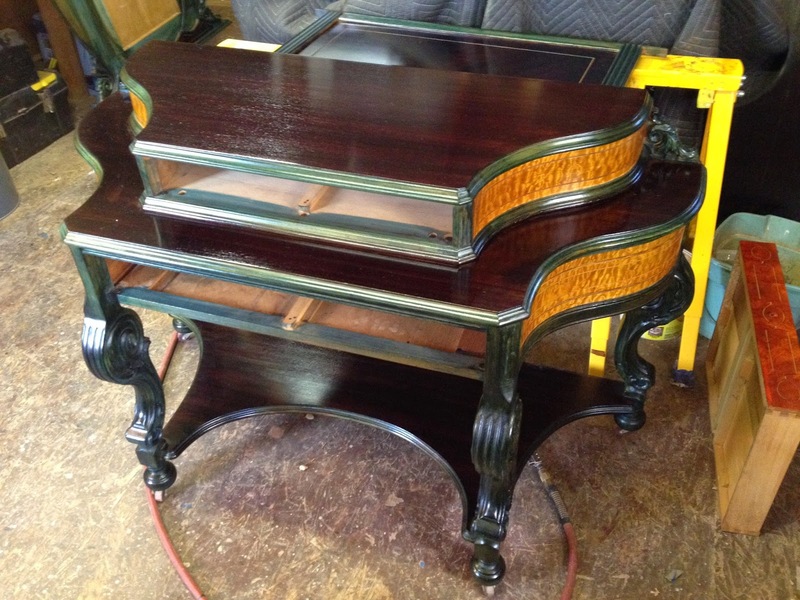 These last photos show the completed bureau.